This easy to follow step-by-step program provides you with all the knowledge you need to be a Black Belt. 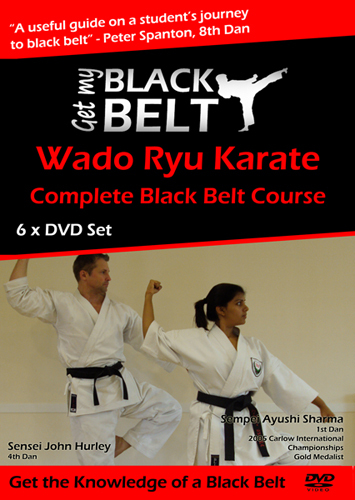 You will learn all the theory, techniques and applications of Wado Ryu karate to a Black Belt level. Practicing regularly, you will increase your fitness and flexibility, increase your confidence and learn how to protect yourself, your family and your friends. This program not only demonstrates the techniques but also breaks them down and explains them to you while also pointing out common mistakes to avoid. This easy to follow step-by-step programme provides you with all the knowledge you need fight effectively. You will learn all the theory, techniques and tactics that normally take a martial artist or security professional years to acquire. • are realistic – designed against specific attacks you may find yourself having to defend against. • are effective – with fast moves aimed towards pressure points and target areas. • require no martial arts experience – anyone can perform these moves with a little practice. Following on naturally from 140 Combat Moves, this DVD set provides you with advanced principles to fight at a high level. You will learn all the theory, techniques and tactics that normally take a martial artist or security professional years to acquire.